I started two new books this week. 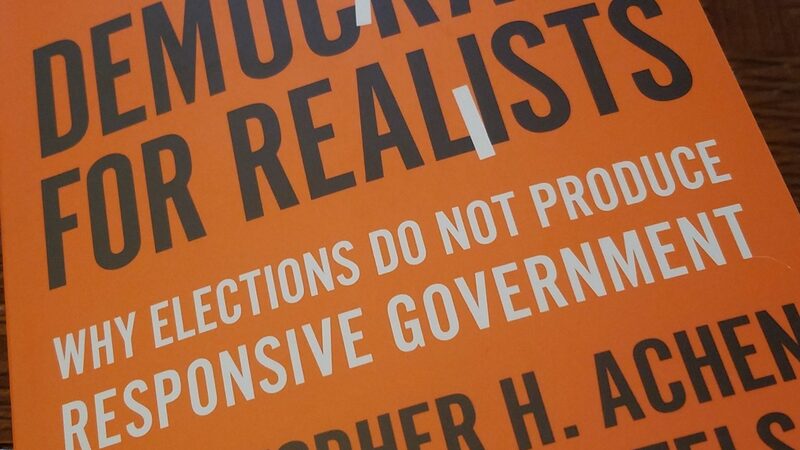 The first one, “Democracy for Realists,” was recommended by Mark Manson on New Years Eve. It’s fascinating, but a long and more difficult read for me. I can only stay focused on it for about an hour before my brain starts to get tired! I’ve had the same idea, that elections really don’t mean anything, for a long time but couldn’t really defend it. This book is giving me some great insight to my intuition. I’ve run across a few things I don’t agree with though. Government, federal and state, has gotten into the habit of micro-managing the people and the people have learned to depend on it instead of taking care of themselves and their own families privately. The election process we have resembles a professional sport now, with one team against another and no principles to speak of. This book gets into why that is. Because I can only read this book for about an hour before my brain gets buzzy, and I my goal this year is to read for an average of three hours per day, I picked up another book to read at the same time. It’s called “Snow Falling on Cedars” by David Guterson. I found it at the thrift store for a dollar a few months ago and was intriqued by the cover. Yep, that’s how I find books sometimes, especially if they are a dollar. If I don’t like it right away, I stop reading it and drop it back at the thrift store so they can sell it to someone else. I’m only out a dollar. This book is turning out great! World War II, Japanese immigrants being sent to Manzanar. It’s historical fiction and one of my favorite eras. I’ve been to Manzanar with my family and read a few other books about what happened. One was called “Nisei Daughter” by Monica Sone. What I already know is blending into this story so well. One thing I found so strange when I first started reading about the Japanese Internment was how quick we all were to “evacuate” these people. The more I read, the more I understand. It wasn’t like we all just turned on them. We were already wary of them. Japanese culture is very different from Western culture. Many behaviors that the Japanese consider respectful and honorable, we see as rude and suspicious. It was difficult for Westerners to accept them into society and the many immigrants did not want to assimilate either. They wanted to live thier own way and be left alone. When Pearl Harbor was bombed, it was easy for us to villify the Japanese immigrants and our government was happy to comply with our wishes. I’m really fascinated about cultural differences and how they affect people’s perception of others. Don’t think we have outgrown our wariness of strangers! There was a lot more going on at the time, especially on the west coast of the United States. It’s a interesting topic. Since I’ve read a bit about it in the past, this story’s setting is very clear to me and a fictional account of a love triangle and forbidden relationships in the midst of World War II is icing on that cake. 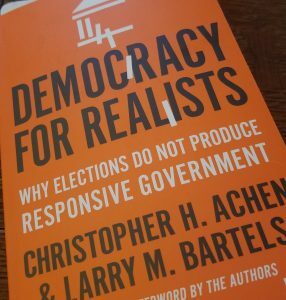 I think it’ll take me awhile to read “Democracy for Realists.” It’s long and involved, but I’ll write more about it as I read. 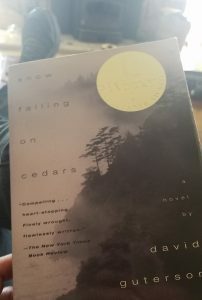 I’m already more than halfway done with “Snow Falling on Cedars.” It’s that engaging!